When I first came to Australia, my father told me four things that I have to do here: Diving, skydiving, keep exercising and go to the fish market in Sydney (he is a chef)!! Up to today, I have ticked those boxes on my bucket list, except “keep exercising”, haha. I know I’m a bit lazy on exercising, but I’m not lazy on challenging myself to take new adventures! Lots of girls are afraid of heights. Me too. 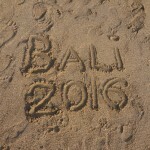 But after the trip to Gold Coast in Australia, I have one more thing to brag about of my life—yup! I did skydiving there! It’s not actually Gold Coast where I did skydiving, it’s a place near it, called Byron Bay—Australia’s most easterly point. And it’s about 1 hour drive. The night before I stayed in Crown Plaza hotel in Gold Coast, and the next morning about 7am a mini-van was sent by the Skydive Byron Bay company there to a place to pick me up, which is not far from my hotel. When I got on the vehicle, I saw many exciting and sleepy faces—I know how much young people like to sleep in. On our way there, we were given liability waiver agreement to sign, and also handouts about attentions before skydiving. Make sure you read them carefully, that is really important, no kidding!!! After that, you have to write down your name, height, weight and emergency contact stuff. Then, be ready for your adventure!! Because I was a first timer, I chose tandem skydiving which means you skydive with an instructor on your back! When we arrived, lots of people were already there waiting in the line to get their life changed! I was a bit nervous when I was standing in the queue, at the meantime, I was watching the videos of people just skydived… what an experience! I chatted with some just landed people, asked about how they felt when they jumped out of the plane, they said it’s not that scary and you get used to it real soon. At that point, I believed them. And now, I can’t believe that I believed them!! I waited about one hour to finally get to pay my fee. 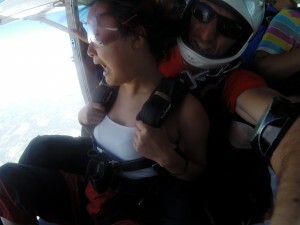 The skydive fee is $334, and I also chose a $160 handicam video and photo package, so it’s $494 in total. To pay the fee before you actually skydived is a smart move, that way you can tell yourself, there is NO FALLBACK!!! Jingqi A: let’s just go back, you certainly can ask for your money back! Jingqi B: why time goes so slowly!! That’s gotta be awesome! Let’s try something not most people will, tough girl!! No matter how nasty the war in my head was, the time still goes in its normal way. And my instructor came to tap my shoulder—ok, I accepted it, it’s my turn now. At first, he helped me get dressed with skydive pants and a “vest” for attaching to your instructor’s. Later, you had to put all your necklace, rings or any other valuables in the locker. Then, the instructor would give us a little session about the important moves when we skydive. 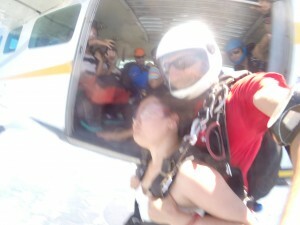 Literally, you would not remember all of them even if you did before skydiving, because at that moment, the only thing in your head is blank, but again, that’s the good thing to have an instructor on your back— he or she would correct your movements. This is it!!! After the instructor and I introduced ourselves, we walked to the plane. At that time, my brain had no room for thinking “the last pair get on the plane would be the first to jump out of it”. By the time I realized it, it’s all too late, I mean, TOOOOOO LATE!!! Oh, and one thing to remind all girls, DO NOT WEAR A BRETELLE when you skydiving—it’s very cold and windy at 14000 feet high, and when you jump out of the plane, it’s even colder and you will feel less of sense of security. And your skin could be hurt due to the rough knitted parachute “vest”. I knew this because I made that mistake. 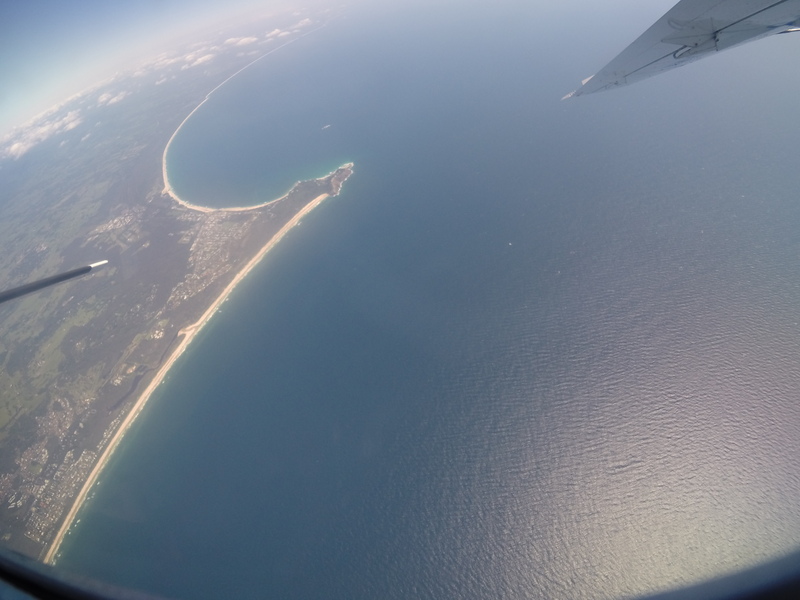 When the plane got higher and higher, you can see the whole view of Gold Coast and Byron Bay— the masterpiece of God!! There’s no word in the world can describe that kind of beauty, and your FEAR!! 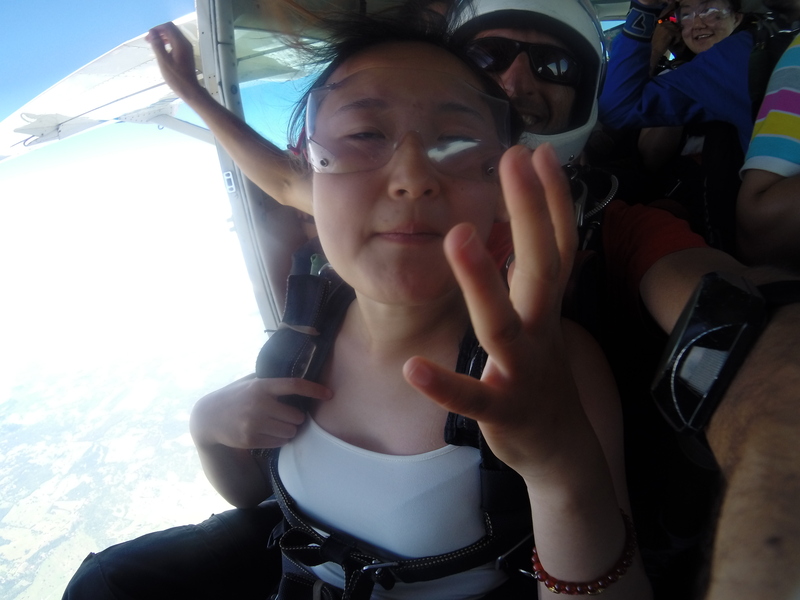 Do you know what you will experience if you jump from 14000 feet high? The ultimate thrill of freefall at over 200km/hr for up to an insane 60 seconds, and then float under canopy for 5-7 minutes soaking up the spectacular views from above. Yes, I said all my “last words” the second my instructor opened the door on the plane. And I even acted “you jump, I jump” scene with him. After the instructor tapped my shoulder 3 times, the next second, my world went upside down. Seriously, I almost vomited on my instructor. And the next 60 seconds were also amazing “torture” to me. I felt death and freedom at the same time!! If it’s not for the goggles, I couldn’t open my eyes to the DEAR MOTHER EARTH!! God I missed land!!! When the parachute opened, I felt a great lift on my back which also made me want to vomit. My poor instructor suffered from 7 minutes’ high decibel shouting. Remember girls, don’t be ashamed to scream out loud. Because at that kind of speed, screaming is the only way you can breathe!! I screamed and “F**k” all the way down to the drop zone. My instructor said I was the one who screamed the most he had in his entire career life. After the “dying phase” of my life, I was still in shock that I actually did it. To be honest, girls, skydiving is the experience you will remember for your whole life!! Oh, btw, if you want to do skydive, you should place your order with the company 48 hours prior to it. Their pickups are free. And attention, make sure you haven’t had any alcohol or scuba diving 24 hours before skydiving, seriously, don’t party too hard if you want to skydive the next day. Wanna know that experience in advance? Watch my video below, and you will feel your heart bumping out of your chest. check my skydiving experience here!! Good luck girls, if you really want to do that, and I applause for your courage. As for me? Been there, done that, never again, haha. Wow Jingqi! I had fun reading your past experience skydiving in Gold Coast – the whole time I was reading I was imagining myself in your shoes and your commentary of each stages of your skydiving adventure made my reading about it more exciting. Skydiving is definitely on my “Things to Do Before I Die” list. I wouldn’t say that I’m acrophobic, but heights in general tends to make me nervous especially when it comes hand in hand with speed (note: roller-coasters). 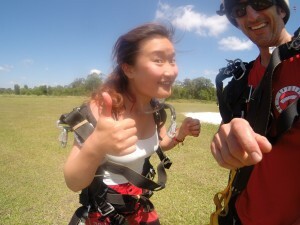 But then again, I have that tendency in me to want to try something different and the kiasu-ness (http://www.urbandictionary.com/define.php?term=kiasu) when challenged by my friends – so, I can definitely imagined myself going up on the plane and skydive. Reading your skydiving adventures definitely make me want to try it more. If a 90 year old woman can celebrate her birthday by skydiving (http://metro.co.uk/2016/05/03/grandma-celebrated-her-90th-birthday-by-going-skydiving-5856138/), I could do it too! If I was someone who planned to go skydiving, I would love to read other people’s experience first. I am not afraid of heights, but it is quite normal that an ordinary person finds jumping from 14000 feet crazy and scary. A detailed description of the whole experience, about booking, payment, preparation, and mental battle, not just the skydiving itself, would make everything look easier and more practical. It is like a rehearsal for something frighteningly exciting. It is very enjoyable to see how the writer was struggling within her own minds, as it is perfectly normal to find skydiving both appalling and appealing. The little fight between two Jingqi makes me laugh, and also makes me released if I am about to feel the same entanglement. 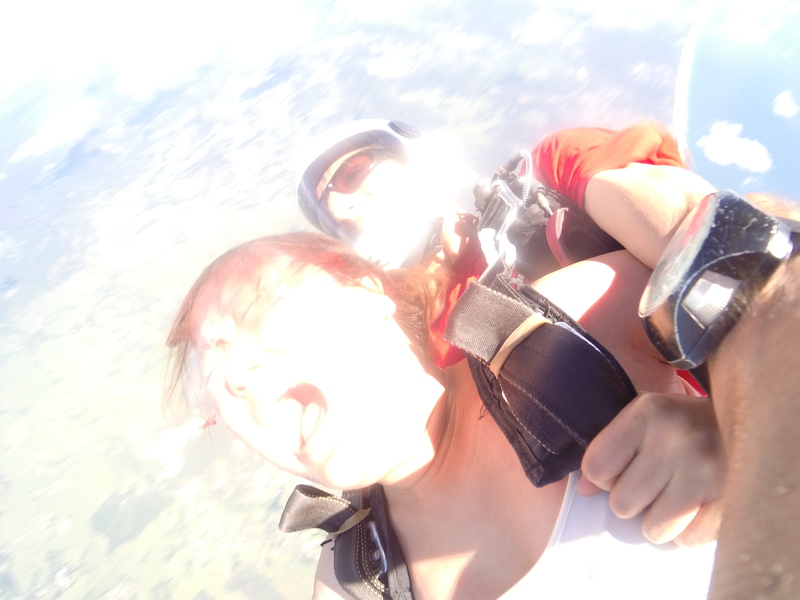 It is also entertaining to see how the writer describes her very first time with skydiving, crazy, frightening and even vomiting, yet at the same time fascinating and hard to resist. The writer has given a lot of personal tips and advice such as put on more clothes as it is very cold up there, or screaming is the only way to breathe so do not feel ashamed about it. The video put at the end is so hilarious that I would love to give it a try in the future! I just have one word, WOW with WOW on top. What an interesting reading and how well you described it. I was imagining the whole scenario with you screaming and the instructor behind you and you trying not to vomit. 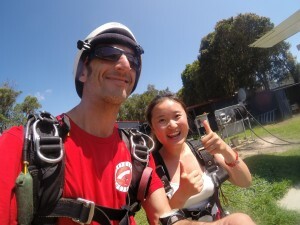 The instructor does appear to smile on all the pictures, maybe he enjoyed skydiving with a total newbie and was reminded how fun it was the first time. Who know! I feel my adrenalin perimeter has an itch that needs to be scratched. I have thought of skydiving many times, though I have a fear of heights. I do feel it is important to challenge yourself and face your fears, in that way you can rest in yourself much more and the next challenge will seem less frightening. I “forced” myself to take the scuba diving licence and it was scary, because under water you are not in control and you must respect the powers of the sea and mother earth. The same with skydiving, though a much more different experience in addition to the speed. 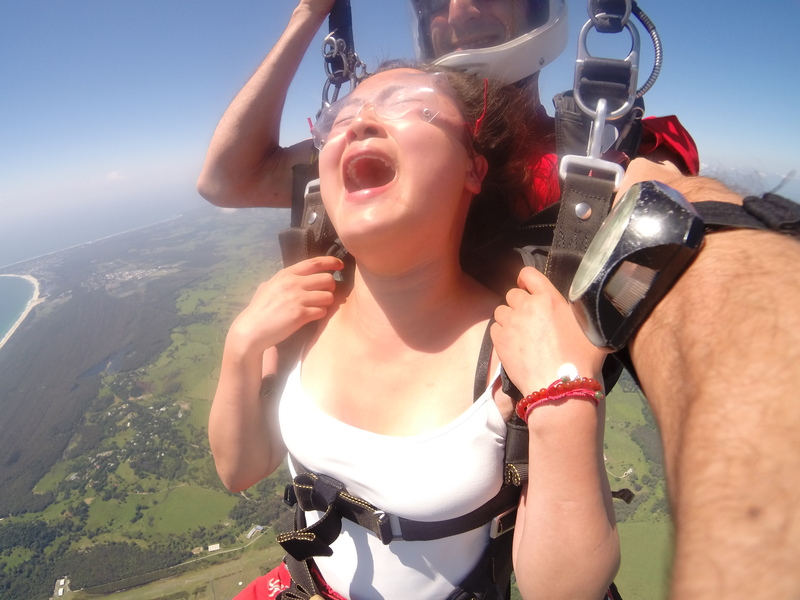 When I go to Queensland, I will definitely look into skydiving in Byron Bay. What an interesting reading and how well you described it. I was imagining the whole scenario with you screaming and the instructor behind you and you trying not to vomit. The instructor does appear to smile on all the pictures, maybe he enjoyed skydiving with a total newbie and was reminded how fun it was the first time. Who knows! I feel my adrenalin perimeter has an itch that needs to be scratched. I have thought about skydiving many times, though I have a fear of heights. I do feel it is important to challenge yourself and face your fears, in that way you can rest in yourself much more and the next challenge will seem less frightening. I “forced” myself to take the scuba diving licence and it was scary, because under water you are not in control and you must respect the powers of the sea and mother earth. The same with skydiving, though with a much more different experience in addition to the speed. 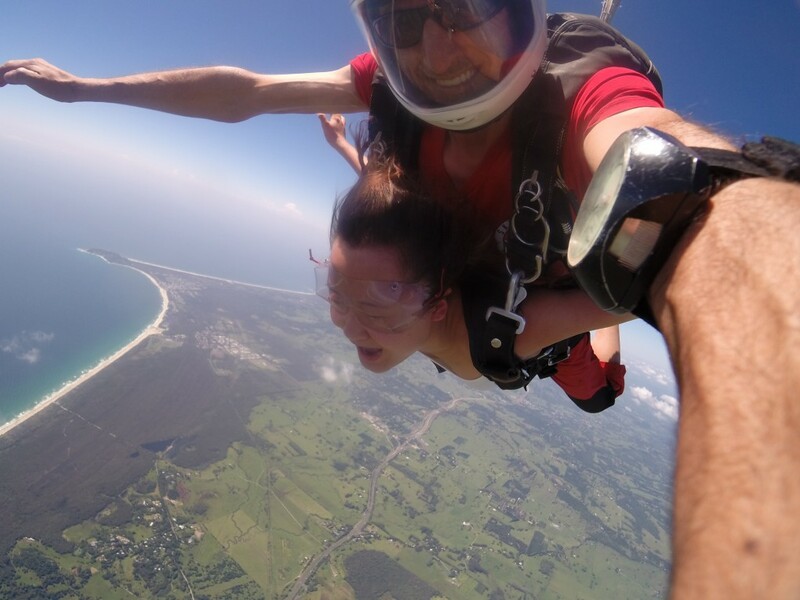 When I go to Queensland, I will definitely look into skydiving in Byron Bay. Hi Jingqi, very exciting experience you had, real impressive! I’m not afraid of height but I’m sure I’d still hesitate when it comes to skydiving. I still remember how scared I was when I was over at the Adventure World last year. Some of the steep rides I tried like Abyss Roller Coaster or SkyLift, were real SCARY. It not when it gets sky high that scares me, it’s actually how I suddenly fell from up high to the ground that freaked me out. And when I was on the rides last year I actually had some terrible thoughts, “Damn, I’m too young to die now”, “OMG OMG OMG”, “What if the rail breaks?”, “I’M DYINGGGG!” …..And now we are talking about falling from 14,000 feet high?! NO WAY! No matter how much of a coward I seemed like, I would not let the fear hold me back since I believe that it’s always better to make the most when we are young rather than regretting not having done much when we get old. Throughout the past 23 years I’ve always been an indoor type of girl and I never felt bad about it until I watched the MV of Avicii -The Nights (https://www.youtube.com/watch?v=UtF6Jej8yb4). The video somehow triggered all the passion and power in me and make me want to do more with my life. So YES, skydiving will be my next adventure and I’ll simply just relax and enjoy the feeling of flying.